Collaborative Robots bring automation to all people. Traditional robots require massive investments in equipment, expert people, and space, while Cobots with their high degree of flexibility can be slipped into established manufacturing routines to streamline them, and eliminate the high employee cost of smaller dull, dangerous, and dirty tasks. 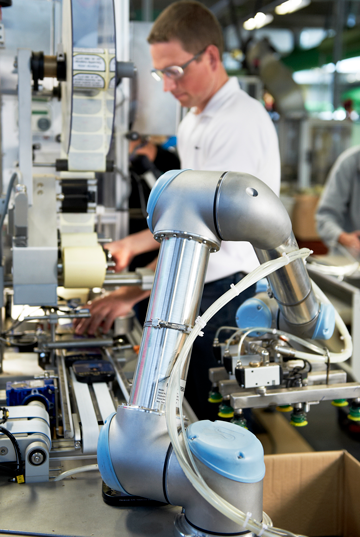 Cobots are designed to be inherently safe to work side-by-side with people. It's that simple. Yet if you are in manufacturing, you probably understand how large a paradigm shift that is. Suddenly countless short-run, dangerous, repetitive tasks requiring human flexibility can be looked at differently. Add robot vision guidance, and the productivity gains are almost unlimited. In an environment of incessant demand for lower prices, higher quality, and faster deliveries, something has to change for you to maintain your profitability. Cobots have safely been making a proven difference in thousands of manual production tasks for the past 6 years. Manufacturers of all sizes in most industries are already implementing, with a rapid ROI, these powerful new productivity tools to free their talented staff up from boring, highly repetitious tasks, as they eliminate staff shortages and production bottlenecks, reduce scrap and waste, increase product quality, and generally lower their cost of production while speeding up their plant's product throughput. These collaborative robots are easily programmed, and then re-programmed. With their extremely small footprint, they can function smoothly in the same work space occupied by your employees, making cobots the perfect complement to many of the 90% of manufacturing tasks that cannot be practically automated using traditional robots. With Level 4 Collaborative robots, no safety mechanisms are required because the cobots themselves are inherently safe. Consideration must be given, however, to any danger presented by the parts being moved and the end-effectors used to hold those parts. Freed from the cage of safety guarding, cobots’ capacity for precise performance of repetitive tasks has led to their rapid adoption for completing tasks human workers find most boring. The most recognizable cobots are those with one 6-axis articulated arm, but collaborative robots are defined by their safety as an electromechanical coworker to humans, and as such, some collaborative robots look like traditional SCARA robots. Others, like the family of autonomous mobile robots from MiR, operate safely in offices, warehouses, and factory floors, delivering files, inventory, tools and parts as they navigate independently and safely through buildings that do not normally need to be modified to accommodate the transportbots. The reality experienced by most factories is that there are not enough qualified workers to fill the roles manufacturers need. Eliminating boring, repetitive tasks has led to a higher rate of worker job satisfaction because skilled workers can be reassigned within the factory to perform higher value tasks. Empowering people is the cobots’ most important accomplishment. HTE Automation is your Cobot resource if you are located in Kansas, Missouri, or Illinois.